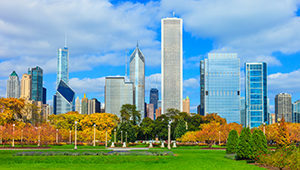 View of Chicago skyline in autumn from Grant Park, Ill.
Save the date for the Ace 2017 Fall Convention & Exhibits August 17–19 in Chicago, Illinois! Get ahead of the game and register now for your badge and housing. The Fall show will include all of your favorite exhibits, including Outdoor Living, all things Lawn & Garden and grilling demos — back by popular demand! You also won’t want to miss our incredible Power buy offers and exclusive Savings Showcase that has deals for days.